Real moms don't loose their cool. Real moms do loose their cool. Depending on the situation I do pretty good. Take last night for example. I'm in bed last night around 8:30 putting Snow Baby down for the night the older kids are getting ready for bed. Little M comes running into my bedroom and trips and falls and bangs his body. I jump up because he's on the floor crying. I swoop him up in my arms and hug him, soothing him. I push him away slightly so I can get a look at him and see that he is bleeding. I pick him up and take him to the bathroom and over my shoulder ask hubby to please come to the bathroom while I walk past the living room. My chest is covered in blood, as well as my chin. I had no shirt on as I was laying down feeding baby. Little M is pumping blood out the middle of his forehead. I grab some face clothes, wet them and hand them to hubby. 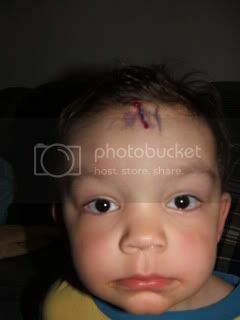 I walk down the hall and call the nursing station to inform them I would be bring my two-year old in to have stitches. I've been through this before, I know what to do. I didn't freak out when it happened to SmartGuy either. My second phone call is to my mom to come and watch the other boys as hubby and I take Little M in. He didn't get stitches for his inch long gash, he got glue and stereo strips or whatever they are called. We got home I gave him some tylenol and laid down with him. He just kept saying 'ouw' and pointing to his head right up until he fell asleep. Poor guy. He's totally fine today and likes looking at his forehead in the mirror. He's a picture from when we got home last night. I'm no good with head and face wounds. All that blood freaks me out. The last time DS did that, maybe two years ago, I freaked and made DH come home! I like to think I will be better about it the next time! Begging for a new pic and recipe on cheesecake..